Most of the world just wants to be left alone. When enough people like us begin to actively support the idea that other people are better at individually running their lives and meeting their needs than politicians, bureaucrats, spies, military, and police who crave more of our money and power over us every hour they’re awake… Our worlds will begin to change. At the moment government is seen as a “necessary evil.” Most people understand that what governments do every day is evil and unlawful. Politicians ignore their abuse of power as they burn through our money and sell debt that will beggar our children. Today’s infants will be forced into debt slavery to pay for all the current political stupidity unless we get outside of the political box to cure the disease of politics, governments of evil, and monopoly power. Let’s help reframe the “necessary evil” belief with questions. Pro-Government Propaganda would have us believe that most people can never understand how so-called government monopoly services can be provided at lower cost, higher value, voluntarily paid for, and with entire industries made obsolete. This happens when we have Free Market Providers to choose from. Kind of like shopping in a Grocery Store, an Apple Store, or online suppliers. What makes anyone believe that we can use evil to create good, peace, abundance, justice, unlimited opportunity, the opportunity for personal growth and more good things for everyone? When has evil ever made the world a better place for those outside their gang? We can defy the Royal Elites, their bureaucrats, regulators, and regulatory police state. We can choose to ignore their slippery slopes that lead us into the traps of the Monopolies and Cartels that the Evil-Politically-Powerful Protect & Promote. We can create and support competition to the arrogant, ignorant, and power addicted. We can use alternative news channels, newsletters, and blogs that report ???? Make Your Purpose & Path Before You Make Your Page!!! People are basically good. Put me or you in an evil environment, we will become basically evil for self-protection or we will do our best to stay invisible and set some lines for themselves. We may not even realize it’s evil. The practitioners of evil have had thousands of years perfecting their systems of control for their benefit. Politics and Politicians are not as stupid as they appear. The politicos are doing what works for their personal benefit while serving the 300 or so lunatics at the top of their pyramids of power. The only obstacle for Green Tea Coffee Club Members to achieve incredible new levels of health and healing are bureaucrats, monopolies, and cartels who use force, fraud, and incredible sums of our money to defend their empires. The information we need to create health, healing, and “Forever Young” as our age selection choice is here today. Now we need to help make them EASILY available today… And the dinosaurs are fighting mad; because they are going extinct despite their awesome size, ferocity, and political protection. Green Tea Coffee Club is creating our own local and online Free Thinkers Clubs that meet to drink the Healthiest Cups of Green Tea or Coffee in the World as we Explore Health Innovations, Age Reversal Technologies, Nutrient Choices, Weight Loss, Detox, and wherever Our Health Freedom leads us. How did so much get so Out Of Date? For instance, do you remember being taught that chlorophyll in plants converted sunlight to food and that you and I do not have the ability to convert sunlight for ourselves? Then how do we create Vitamin D3 from sunlight? The Sunlight Fairy? 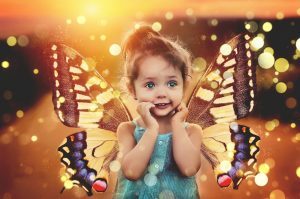 5arah / Pixabay – The Sunlight Fairy? We have melanin in our skin which converts the sunlight to nutrition for our bodies. Our schools and media taught us current fads & opinions in science as fact. The people who write the news were taught the same nonsense we were. Change is always slow to come. Just think of how many students were taught that Pluto was the ninth planet. That was the only approved answer and it was wrong. School systems attempt to teach us to quit thinking and questioning. Education has been perverted into telling us to select between opinions by government-approved authorities disguised as facts. Health classes taught us the politically created Food Pyramid as fact. Politics provided and promoted guidelines that created horrible health and resulted in a ridiculously diseased, overweight, and drug enfeebled population. Today the victims of the misinformation of a politically created food pyramid are prescribed high-profit drugs to suppress symptoms that are the results of Politically Powerful Pyramid Pushers. Perhaps the nay-sayers thought that ducks and geese filled themselves with hydrogen and when they were shot, the bullet let the lighter air out of the bird which caused the bird to fall to the ground. We could write volumes on the history of politically approved false beliefs and the political suppression of innovations, other ideas, and even questions. We are surrounded by false beliefs today. We do not and cannot identify all of them; because we have blind spots and deficiencies in our thinking. If we can remember “we’re not perfect”, we will never be as stupid as the monopolies, regulators, automated cops, and politicians. We aren’t as easy to intimidate as children. So let’s ignore the power-addicted who push their false and self-serving beliefs as if they are fact. Out Green Tea Coffee Clubs seek new and better innovations to everything even though innovation creates changes that dissolve and replace the existing power structures. Let’s question, imagine, share information and innovations despite the dinosaurs. Long Live the Green Tea Coffee Club! Watch our Intro Video and learn more about a simple cup of tea and then join us for tea or coffee as we explore forbidden Health, Healing, and Age Reversal Secrets. The Japanese are frequently listed as one of the healthiest populations on the planet. Healthy, Long-Lived, Japanese average drinking over 10 cups of green tea per day. Special Thanks to: Hartwig K. Delaney who has granted permission to use Yin and Yang and others photos in our on our website and collectibles. “I’ve put the symbol into a bubble to make myself clear about the fact that both forces have one source. “The symbol of Yin and Yang to me is a wonderful example of ancient wisdom put into a metaphoric picture. “Through all the ages those who made ecstatic experiences left pictures trying to explain something visually which needs no explanation in words because it speaks itself. I like to continue this tradition. ‘This picture is my interpretation of the antagonistic energies and the unity behind. In fact inside the bowl should be nothingness. As I cannot show this, I show a symbol of duality which represents oneness in its dual apparent.